What Markets Work Best for Ice Cream Business Expansion? If you choose to open an ice cream franchise, the markets available for expansion will depend largely on the company you choose to franchise with. Some territories will already be claimed for development and others may not be slated for development until the franchise company begins to pursue that phase. 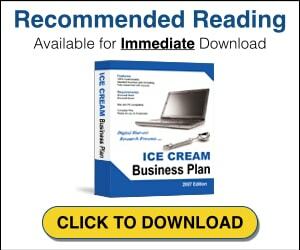 To find the ideal location for your ice cream business you need to consider the following. An ice cream business benefits largely from foot-traffic. In order to be successful you will need to locate yourself in an area where you will receive high visibility from a steady volume of passers by. Be careful! You want to avoid areas where there are extreme fluctuations in traffic. A location that is busy on weekends may not produce enough business on Saturday and Sunday to make up for the rest of the week. You also want to remember that the ice cream business can be very seasonal. While there are a large number of ice cream lovers that eat ice cream all year long, a lot of ice cream eaters will cut their consumption in the winter months. The ice cream business is seasonal. Because of the fluctuations in traffic patterns and tastes throughout the day, some ice cream franchise operations have teamed up with other concepts to help off-set the slower periods. This is an excellent idea and can yield much steadier traffic.